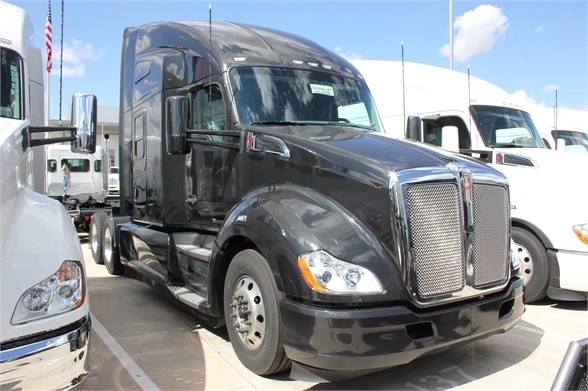 Take a look at this 2020 Kenworth T680. It is Stock# LJ379090 at TruckerToTrucker.com. **MORE OUTSIDE PHOTOS COMING SOON** - Eaton Endurant 12 Speed / Automatic - Front Air Disc Brakes - Jump Start Terminals Mounted Under Hood - Espar Sleeper or Bunk Heater: Airtronic D2 - Integral Heat Driver Seat - Drawer-Style Refrigerator/Freezer Mounted Behind Driver Seat - Wall Mount for TV up to 22" - 1800W Inverter with 120V LVD, 4 120V Sleeper Outlets - Windshield Curtain with Integrated Track, Storage as B-Pillar Discover what it is like to drive a quality truck with proven results. We welcome you to stop in to our new facilities today, meet our team, and see how The World’s Best Trucks can transform the way you drive. - PRICE INCLUDES FET - Our financing experts will find a financing option that fits your needs. We also welcome trade-ins. - Sales tax-free for out of state purchases and in state lease purchases. - We ship anywhere in the U.S. - $5,000 freight assistance for shipping to Hawaii. - $1,000 OOIDA rebate. The financing button above is "NOT" a part of Inland Kenworth. It is a third party finance company that cannot offer you Paccar financing. We would be happy to assist you in getting a financing quote. Please use the "Email Inland Kenworth-Phoenix" button found above by the contact information on this page. Have a great day!